Naharyia, Israel: For quite some time, I had been hearing about the cable cars in Kiryat Shmona, reputed to be the longest cable car ride in Israel, and yesterday, I went to see for myself. In Rosh HaNikra, only seven miles from Naharyia, there is a short cable car ride that takes a dramaticly steep downward journey to the caves carved out by the crashing waves of the Mediterranean, but today I was determined to ride the cable cars at Kiryat Shmona and enjoy the scenery on the way. I hopped a bus to Akko, from Naharyia, and at the bus station where I had a planned meet-up with friends. We boarded the express bus #500. The express part of the trip was only to Carmiel, and from Carmiel to Kiryat Shmona, it was supposed to be a local bus. This description turned out to be oxymoronic. 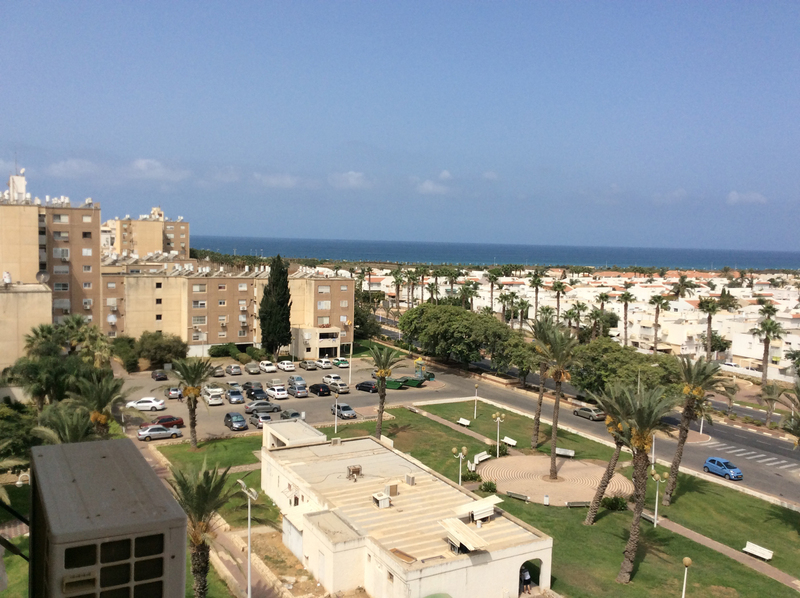 While it was true that the bus did not make any stops from Akko to Karmiel, the entire ride to Karmeil, was one of stop and go and, when finally going, it was at the recklessly high speed of five to ten mph. Eventually we finished traveling that bottle-necked part of the road and began the non-express part making many very quick stops and moving over the highway at a good speed. The entire trip was supposed to have been one hour and forty-five minutes, but it took us two and one-half hours to get there. The menu had a priced-fixed businessmen’s luncheon. It came with fourteen different “saladim” dishes, all delicious, hot freshly made rolls, drinks, plus the main dish. We selected the salmon steaks, talipia filets and beefsteak. From there it was a short walk to the cable. Rivka and Ariel are aboard the cable car, above, as we await take off. The cable cars travel in threes. At the top of the summit are hiking paths, a restaurant, a climbing wall and play cabins for children, a hotel, and a restaurant. Also on the premises are a roller coaster ride up and down the summit, rock climbing, and two very large trampolines. We thought we might see some migrating birds there, as Kiryat Shmona is in the Hula Valley, but we did not. We did, however, see lots of cranes in the olive groves both on the way to Kiryat Shmona and on the way back. Our trip back turned out to be another adventure. We took the #500 express bus again, and again the bus zipped through the larger leg of the journey, making brief stops, but when it came to Carmiel it was lurch and throttle all the way. It took almost three hours just to reach Akko. When we reached Akko, but were still at least a mile away from the central bus station, the bus drier was stopped by a policeman. Immediately most of the IDF passengers got off and began walking towards the center of town. We waited while the policeman castigated the driver until finally, another bus #500 showed up, and the bus driver waved us over to get on that bus. We were worried about the first drivers future with the Egged Bus Company. We had thought he was not only a very good driver, but that he behaved in a very professional manner. We arrived back in Naharyia tired and satisfied. Satisfied only until it is time for another adventure. Categories: Travel, Uncategorized | Tags: Akko, cable cars, Hula Valley, Kiryat Shmona, kosher, Mama Calsa Restaurant, Naharyia, Rosh HaNikra | Permalink. Less then a week before Rosh HaShannah we were forced to move. The mover gave us an estimate at 1pm on Monday afternoon and at 5pm on the very same day brought boxes. He was supposed to come at 8am the nest morning but I asked him to put it back to 9am. He agreed. Tuesday morning at 7:30am the mover, with three helpers, was knocking at our door. Hours later, hot and tired and surrounded by boxes in our new apartment, we didn’t know if we were too electronically challenged to work the remote or if the A/C didn’t work. It was about 90 degrees. We opened all the windows and the next morning everything, including Mick and I, were covered in fine red silt. Our landlady came by to see if everything was alright. She wanted to know why we didn’t clean before moving and I told her we did but with all the windows open, it was a worthless exercise. Before she could ask why the windows were open, I smiled and said, Ruthie, are you hot? She looked at me with an expression of gratitude that we will turn on the A/C for her. I hand over the remote control. She presses every button and to her astonishment nothing happens. Mick and I look at each other relieved. We might still be hot and tired and covered in dirt but at least we were not too hopeless to turn on the A/C. Ruthie calls a repairman. We have no wifi, we are surrounded by packing boxes, and soon depart for the center of Naharyia to eat, use the restaurant’s wifi, buy new mezzuzot, and fruits and vegetables for Shabbat and the New Year. At the mezzuzot store, the owner Yossi tells me he has had time to check only two of the five mezzuzot I ordered but tells me to take them anyway and to come back on Sunday. When I try to pay he tells me to wait until I come back. “I won’t lose any sleep”, he tells me. On line at the grocery store I examine a jar that says dates, but it is in liquid form. I ask the woman in front of me if it is date honey. “No. But you must buy it. 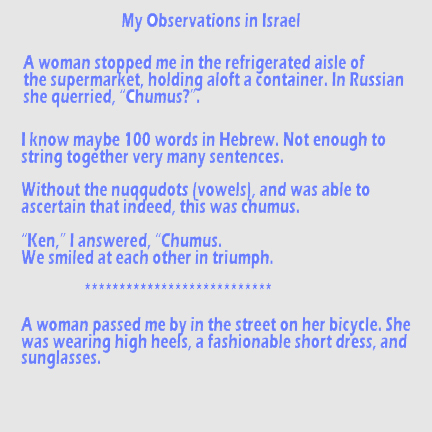 It is delicious and on sale.” She asks if we have the store’s discount card and when I shake my head, no, she tells the cashier to use her discount card for our groceries and then wishes us a LShannah Tova and showers us with blessings. I went to Cofix to buy freshly sqeezed carrot juice for five shekels ($1.25) and while waiting I see two very young Chassidic boys. With their very young eyes they swallow everything in front of them and when the cashier places a coffee milkshake on the counter for another customer, not only the eyes drink everything in but a thirsty mouth descends on the straw. The cashiier snatches the drink back and looks to see if the intended customer saw this partial theft of his drink. He didn’t. She throws the violated straw out, places another straw in the drink and smiling widely, hands it to the unsuspecting customer. Aah, finally time for Shabbat. Since our stove top and oven are not yet hooked up, I cooked on our two burner hot plate and we readied for a quiet evening alone Friday night and for our luncheon guests the next day. I suddenly remembered right before candle lighting that we had been unable to reach our guests to tell them we moved. I wrote out a note and put a piece of tape on the top. The next morning I walked down eight flights of steps, two blocks to the old apartment, up seven flights, posted the note on the door and then retraced my footsteps with my grand finale of collapsing on our couch. We were so happy when our guests arrived and thanked us for the note. For those of you not living in Israel, we hope you too will sometime soon enjoy the warmth of the people here, the feeling of being close to G-d and the beauty of the land. Wishing you a year filled with joy and good health followed by more of the same for years to come. Below is the view from our living room window. In the distance is Lebanon. From our bedroom window, at night, we see Haifa all lit up. Categories: Uncategorized | Tags: Israel, moving, Naharyia, Rosh HaShannah | Permalink. When my husband decided to move to Israel, despite the fact that he is Orthodox, he specifically chose to live in a town that is not mostly Orthodox. A dazzling array of Jews live in Naharyia , mostly with Sephardi and Ashkanaz roots. The mixture includes secular, traditional, Lubovitch, other Chassidm, modern Orthodox, Reform and Conservative. 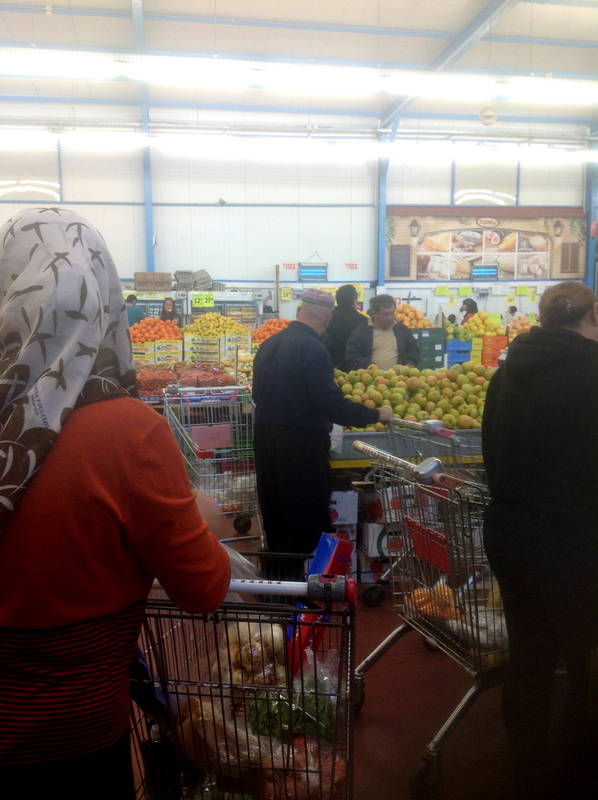 A visit to Faisel’s Market (a huge, and famous, Arab market in Naharyia), will allow you to feast your eyes on a passing parade of Jews, Muslims, Christians and Druze. 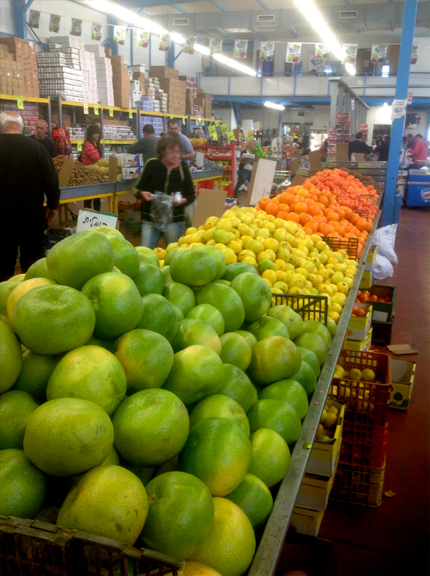 They load up their carts with fruits and vegetables from tables piled high with colorful fresh produce and walk down aisles where shelves display a variety of groceries to please the palates of all those groups. Originally founded by German Jews, Naharyia now hosts Jews (and non-Jews) from all over the world, including Morocco, Russia, Lebanon, the States, England, South Africa, France, Ethiopia and Tunisia. The one thing I have to say I miss here though is the variety of animals. In Cincinnati a doe was delivered on my front lawn and stayed there until nightfall when mommy came back for it. The geese overrun the neighborhood, and I have a family of groundhogs under my back porch and a bachelor groundhog under my front stoop. It is not uncommon to see raccoons, possums, and mallard ducks. They come in pairs to swim in the water above the tarp on my pool, and under the tarp is a breeding ground for hundreds of frogs. After getting over the shock of seeing a lizard scurrying around our apartment several days ago, and twisting our brains to figure out how it got there (we are on the seventh floor), we decided, in the spirit of Naharyia’s diversity to embrace tolerance and accept the lizard. We named our lizard Lizzie. Since we also, not happily, share our apartment with tiny ants, we were not concerned about what Lizzie would eat, but we worried that it might die of thirst. After trying to figure out how Lizzie could access water (a bowl, for instance, would be hard to scale), we settled on an ashtray, one of many that my husband had brought home when we were expecting guests and I had sent him out for serving dishes. Now, like mother hens, we watch the ashtray to ensure that the water level is sufficient to keep our lizard hydrated. While Lizzie is not quite as cuddly as the cats I have owned, or as trainable as the dogs we have lived with, Lizzie does not require much attention. We have decided that Lizzie not only fits the spirit of our new found home, but we are thrilled that we do not have to walk her, shake her fur off our clothes or clean kitty litter. Categories: Uncategorized | Tags: Arab market, Jews, lizard, Lizzie, Naharyia, variety | Permalink. There are many types of stretching. Stretching on awakening to confirm that everything is still working –practiced mostly by the geriatric crowd, stretching into a yoga pretzel, stretching one’s credulity – something we are forced to do every day when confronted with the slanted news–and stretching for self-improvement. My blessings include working very hard rehabbing old houses in Cincinnati most of the year (call me crazy, but I thrive on work) and then going to the sleepy town of Naharyia in Israel for about four months a year, spread out over two or three trips. When there, my Cincinnati business only takes several hours a day as I cannot be on site, cannot supervise, cannot do my daily twice, sometimes thrice, Home Depot (or Lowe’s) runs, and cannot nag the workers except by email. Now I have only myself (and my husband) to nag. I remind myself of my promises to myself that I will whip myself into shape, lose weight, get out those watercolors, write, and promote “Forty Days and Forty Nights, Rain, Rain, Rain”. This is truly a nasty job to beat myself up but who else will do it? My husband is too busy beating himself up. After giving myself lots of excuses; catching up on the bookkeeping (takes about a week), getting over jet lag, getting acclimated to the rhino-weight humidity here, giving myself a well deserved rest, getting over jet lag. Oops, I think I just ran out of excuses. Yesterday I took my beloved bike out of storage for a spin. Purchased three years ago I have been waiting for my husband to join me but finally gave up waiting. He would rather wear himself out by running on the treadmill and lifting weights. The bike fits my personality – it has one speed, one hand brake and can also be stopped by pedaling backwards. It’s old, reliable, past its prime and a little beat up—that’s me. My off and on romance with biking never included learning how to use the gears. In fact, I probably didn’t bike for close to 40 years after dropping into a pothole on West 56th Street in New York, flying over the handlebars, and falling (skirt up) in the middle of the street in front of a moving taxi. After a serious confrontation with my conscience, I biked seven miles yesterday with only one three minute break. It took an hour. Today I biked over ten miles (an hour and twenty minutes with no breaks), began writing this essay, and did a watercolor. My brain is overjoyed, my legs are like jelly and I fear for my sanity tomorrow. Being into one-upsmanship (with me and only me), what will happen tomorrow when I have to top this??? 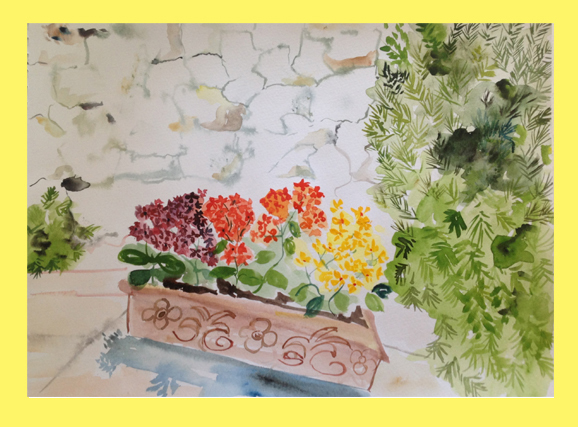 Categories: Essays | Tags: bike riding, motivation, Naharyia, stretching, watercolors | Permalink. Returning from the mokolet* I spotted a bird. I paused in mid-step. This was not your ordinary, every day bird but an insanely bizarre bird. Regally perched on his head sat a cocky headdress, much more regal than a cardinal’s. His colors were subtle like a morning dove – halfway down his body that is, then a stark transformation to black and white circular stripes. Was this a joke? Did someone put him together with scraps from several bird-making kits? Was he squeezing out one more bird from his pile of rejects no matter how ridiculous it looked? The bird flew away and I suddenly remembered that there were three hungry children waiting for their breakfast. This was the last day of Eliav (age 11), Eviatar (age 9) and Batli’s (age 7) visit with Mick and me. Since they had moved back to Israel two years ago, I had only seen them once last year, for a brief weekend and the year before for three short visits. I had lived with them for close to two years in Brooklyn and helped them learn English and become “American”. The three children immersed themselves in Hebrew after their family split in two and their half, those three with their mother, moved back to Israel. Their father, with his new wife, and their two older brothers livi in New York City. In the two years that Eliav, Eviatar and Batli have been back in Israel they totally forgot their English. After just a few days with us, Eliav’s English has miraculously been mostly restored although Eviatar and Batli could only manage to say a few words. Eviatar rejoiced in correcting our Hebrew in a very methodical, syllable-by-sylable manner. I smiled at his new skill while at the same time feeling the loss of the wonderful conversations I used to have with him. That morning the children decided that they all wanted eggs and shokel. Mick had awakened and was at his computer and I burst in, laden with eggs and shokel, and without even a” good morning honey”, asked him about the bird I had just seen. It is the national bird, the hoopoe, he informed me. I said, “Wow – I thought it would have been the kipah bird.” I do not know the name of this brown bird with the black “skull cap” on its head that I referred to, but I thought it appropriate that it bear a name indicating that it covers its head in the sight of God—hence the kipah bird. After breakfast, I rounded up the children to go for a walk on the beach to collect shells, ocean-rounded pebbles and water-polished glass and to walk to the moshav next door. Eliav said that he did not want to get his feet wet, but suddenly we were all in the water watching the ripples tickle our feet and enjoying the coolness of the waves. The air above was hot, heavy and humid. Each step I took felt like I was dragging twenty extra pounds with it. Here in Naharyia the sea looks different every day. Today there were stripes of blues, aqua, cobalt, and sapphire, interrupted only by rippling white foam. The children live inland, and my pleasure of watching the sea was heightened as I tried watching it through their eyes. We walked further, past a canal that meandered through the moshav, past the beaches with their large umbrellas and cabanas that one must pay to gain entry to a cove where the more subtle waves were more suited for our non-immersion style of refreshment. Batli stepped onto a slippery rock and suddenly it wasn’t only her feet in the water but her entire lower body. As we headed back, the children discovered that there were stones by the canal. As they splashed the stones, I thought again about the “jumbled” bird. We Jews are also a jumble—we settled here from Morocco, Iraq, France, China, India and Ethiopia. We began with no common language or customs, some of us are religiously observant, some secular, some atheist but all melded together to build up this land that G-d gave us. Anyone seeing our faces, black, brown, white, yellow and red, and listening to us speak Indi, Arabic, Pharsi, French, and on and on, would definitely find us as bizarre as the bird. A passerby expressed her disapproval of the children throwing stones and I coaxed them back on the path to home. Batli, despite still being wet from her accidental immersion, was wilting until we came across a drinking fountain close to where the bandstand is set up on the beach. The fountain had five spigots, each spigot sprayed water in several directions at one time. Hardly any of the water reached their gaping mouths but splashed onto their bodies. The children shouted and ran back and forth to the fountain as they took turns maneuvering the water so that they were able to spray each other. Their rush to get back to our apartment was forgotten. The boardwalk had a raised walk-out and the children stood there, gazing at the waves, three little specks against the broad spectrum of the sea and sky, hugging every breeze that embraced them. For a while they made dog and rabbit shadows on the sand below and questioned me about what looked like an abandoned fishing rod propped upright on the beach. I pointed at the owner. He was sitting beneath the walk out, drinking a beer, talking on the phone, and casually watching the rod for any signs of success. With their pockets full of sea shells and their minds full of today’s memories we walked back to the apartment. We were our own version of the jumble bird. Three children who had lost half of their family, and me, their only non-related constant in their life for the past seven years. Categories: Essays | Tags: Naharyia, stories about children, summer fun | Permalink.